It is possible to create a common currency that will be "a common ruble," not Russian ruble in the Union State, Belarusian President Alexander Lukashenko said. "They are now offering currency to us. He [Russian President Vladimir Putin] tells me rhetorically that it will of course be the ruble. I am saying of course it will be the ruble. You have rubles and we have rubles. Why do we need thalers? That's not the issue. 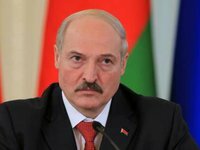 It will not be the Russian or Belarusian ruble, it will be our common ruble, if it is," Lukashenko said at a meeting with public and media in Minsk on Friday.